Visiting a church for the first time can be a little intimidating, whether you are an experienced church-goer or not. It can feel like you are the only person who doesn’t know when to stand up or what to say or where to look or how to sing. And it’s true that churches kind of have their own language and that each individual church speaks it a bit differently. But here’s the good news – you don’t have to be fluent in the language to join us for worship. You are free to sit when you want, to be silent when you want, to wear what you want. We’re just happy to have you with us. But in case you would like to know what to expect in advance, here is a little description of what will happen at the various Sunday services at Christ Church Cathedral. When you enter the Cathedral through the big red doors facing St. Catherine’s Street, you may not be able to see anybody. Walk all the way up the aisle, past the central altar, and you will see chairs set up for the service. A small table holds bulletins and prayer books, which is all you will need to follow this simple, quiet service. When it is time for communion, kneel or stand at the altar rail and put your hands out to receive the bread or cross your arms over your chest to receive a blessing. If you wish to receive the wine, please use your hands to guide the cup to your lips. You are also free to remain in your seat. After the service, please introduce yourself to the priest. You may also be interested in joining members of the congregation for a quick breakfast at a nearby diner! When you enter the Cathedral, through the big red doors facing St. Catherine’s Street, you will be greeted by someone called a “steward”. He or she will (hopefully) offer you a smile and hand you the service bulletin and hymn book. That’s all you’ll need to be able to follow along with the service. This person can also answer questions about restrooms, gluten-free communion hosts, and how to add someone to the prayer list for that day. You are free to sit wherever you like. This is, however, a small service so you may want to sit near the front. 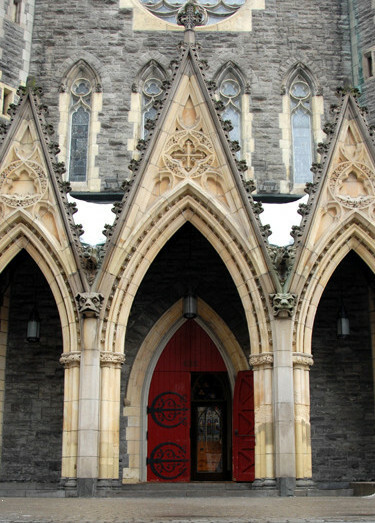 The priest and preacher will sit in chairs at the bottom of the stairs for the first part of the service and the sermon is given from the floor, rather than the pulpit. Music at this service is provided by the organ and a quartet of singers. At 9:00, one of the organists will play a prelude. The title and composer of this piece of music can be found in your bulletin, as can the details for all the music during the service. When the prelude is finished, a lay leader of the parish welcomes everyone to the Cathedral and then, after a moment of silence, the choir sings a piece of music called the introit. 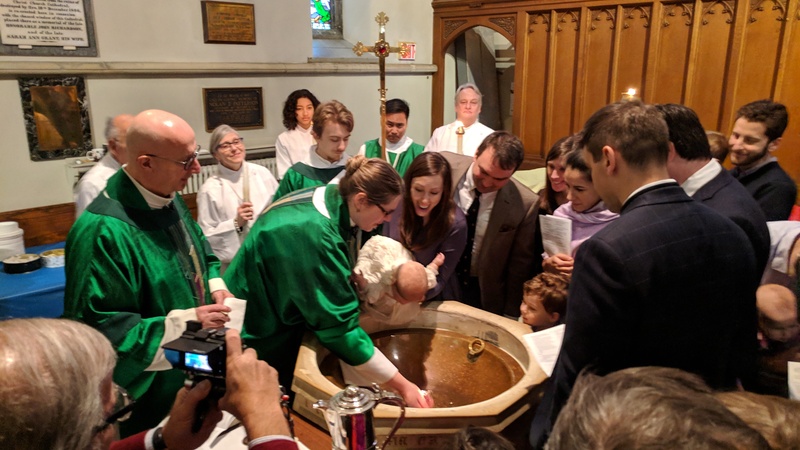 After the introit, everyone stands to sing the opening hymn (the bulletin tells you the number to look for in the hymn book) while the choir, the servers, and the clergy all walk up the aisle and go to their places in order to lead the service. From here on in, you can just follow the bulletin. It offers guidance about sitting or standing or kneeling (but remember – do whatever feels comfortable!). The parts written in bold are said by everyone (but remember – it’s okay to simply listen!). When it is time to receive communion, join the line and simply hold our your hands to receive the bread or cross your arms over your chest to receive a blessing. If you wish to receive the wine, please use your hands to guide the cup to your lips. After communion, return to your seat – the service is almost over. Some announcements, a prayer, a blessing, one last hymn as the choir, servers, and clergy all go to the back of the church, where the dismissal is sung. The only thing left to do is introduce yourself to the clergy waiting at the back and perhaps meet a few fellow-worshippers. When you enter the Cathedral, through the big red doors facing St. Catherine’s Street, you will be greeted by someone called a “steward”. He or she will (hopefully) offer you a smile and hand you the service bulletin and hymn book. That’s all you’ll need to be able to follow along with the service. This person can also answer questions about restrooms, gluten-free communion hosts, Sunday School, and how to add someone to the prayer list for that day. You are free to sit wherever you like. Closer to the front offers better views and can be less distracting as people often come in and out of the main doors during the service. But some people prefer to sit near the back or to the side, which is perfectly fine too! Note that there is small children’s chapel at the back of the right-hand aisle. If you like the sounds of children around you while you worship, this is the place to be BUT if you prefer things a little quieter, you may want to choose a different area. Depending on how early you are, you may hear the choir doing a last minute rehearsal or see people, called servers, in white robes getting things ready for the service. In general, the time just before the service is a quiet time for you to gather your thoughts and prepare for worship. At 10:30, one of the organists will play a prelude. The title and composer of this piece of music can be found in your bulletin, as can the details for all the music during the service. When the prelude is finished, a lay leader of the parish welcomes everyone to the Cathedral and then, after a moment of silence, the choir sings a piece of music called the introit. After the introit, everyone stands to sing the opening hymn (the bulletin tells you the number to look for in the hymn book) while the choir, the servers, and the clergy all walk up the aisle and go to their places in order to lead the service. After a couple of opening prayers, the children and Sunday School teachers gather at the front to receive a candle and the crucifer (person carrying the cross) leads them down the aisle to go downstairs. They will return to their caregivers at communion time. 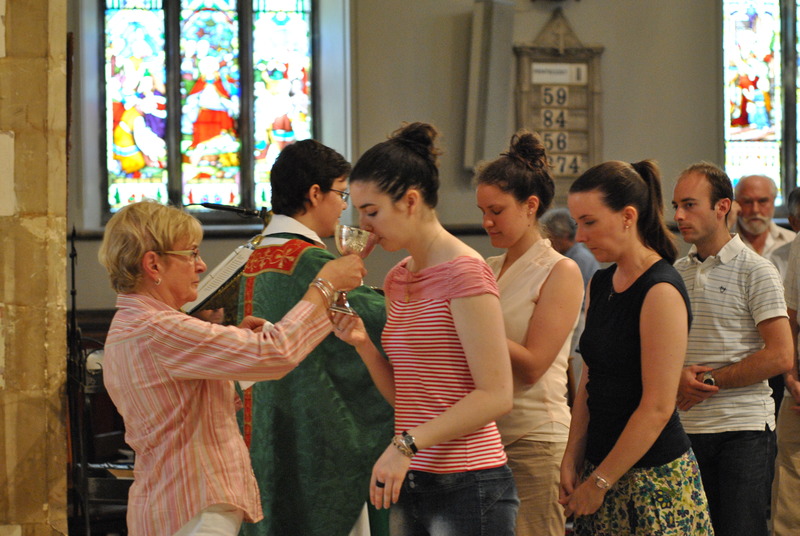 When it is time for communion, the stewards will indicate when it is time for you to join the line – but you are free to simply stay seated if you prefer. If you do wish to receive communion or a blessing, simply follow the people around you and go either to the standing station near the eagle shaped lectern or to the kneeling station at the far end of the Cathedral, past the altar. Once there, simply put your hands out to receive the bread or cross your arms over your chest to receive a blessing. If you wish to receive the wine, please use your hands to guide the cup to your lips. Over in the chapel to your left there will be two members of the congregation who can pray with you and for you. They can pray for healing or for any other concern you may have. When you have taken communion, return to your seat and listen to the choir or say a prayer or join in the hymn. The service is almost over! Some announcements, a prayer, a blessing, one last hymn as the choir, servers, and clergy all go to the back of the church, and then the deacons sings a dismissal. The only thing left to do is introduce yourself to one or two of the clergy waiting at the back and then go enjoy a cup of fair trade coffee in the area just to the right of the altar. Children are welcome at all of our services and our community is highly tolerant of kid noise (particularly at the larger, 10 a.m. service and the monthly informal evening service). Children are welcome to sit with their caregivers or to make use of the Children’s Chapel where they can play quietly with soft toys and books (with a caregiver present, please). There is a changing table in the restroom to the left of the main entrance. During the 10 a.m. service, children are also welcome to go to Sunday School. They can join the other kids and the Sunday School teachers when they gather at the front of the church near the beginning of the service to receive a candle and be led down the aisle. Children can also simply join in the procession as it passes. Caregivers are welcome to go with their children either for the whole of Sunday School or just until everyone is comfortable. The children will return to their caregivers at communion time. While it may seem sensible to sit near the back corner, children often find it easier to pay attention when they can see what is going on. Consider sitting near the front but to the side, so you can slip down a side aisle if the need arises. Feel free to nurse your child or to bring snacks and drinks, as well as books, colouring, or soft toys. It’s okay for your children to go for a wander and you are free to get up and follow along behind if you feel you need to. No one will mind nearly as much as you! In fact, that’s a good general principal. We are always more aware of our own children’s noise and mess than other people are. Other people are more likely to find them charming than upsetting. 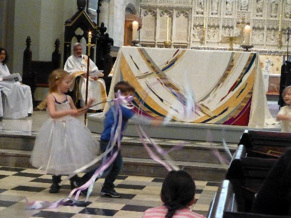 More information about the Cathedral’s ministry with families with children and teens. When you enter the Cathedral, through the big red doors facing St. Catherine’s Street, collect a hymn book, service booklet, and bulletin. You are free to sit wherever you like. This is, however, a small service so you may want to sit near the front. Please note that this service is broadcast live over Radio Ville-Marie. At 4:00, the organist will begin the prelude and the presider will enter and sit at the prayer desk in the crossing. The choir may process in at this time and sit at the front of the Cathedral or they may already be in place in the choir loft above the main entrance. This service is full of beautiful music, creating an atmosphere of peace and contemplation. You are invited to relax, pray, and be refreshed. After the presider says the closing prayers, the choir will leave while the organist plays the postlude. Please stay seated until the presider leaves his or her seat at 5:00, when the radio broadcast ends. You are encouraged to make a donation to the ministry of the Cathedral by leaving an offering in the plate on your way out.